This dramatic foyer redesign boasts a suede faux finished accent wall adorned with a berry silver mirror. The decorative jar adds a pop of color against the rich blues. The blue hues continue into the design of the living room. A Beautiful historic building in downtown Hoboken is the site of one of J. West Design Services LATEST ongoing renovation projects. 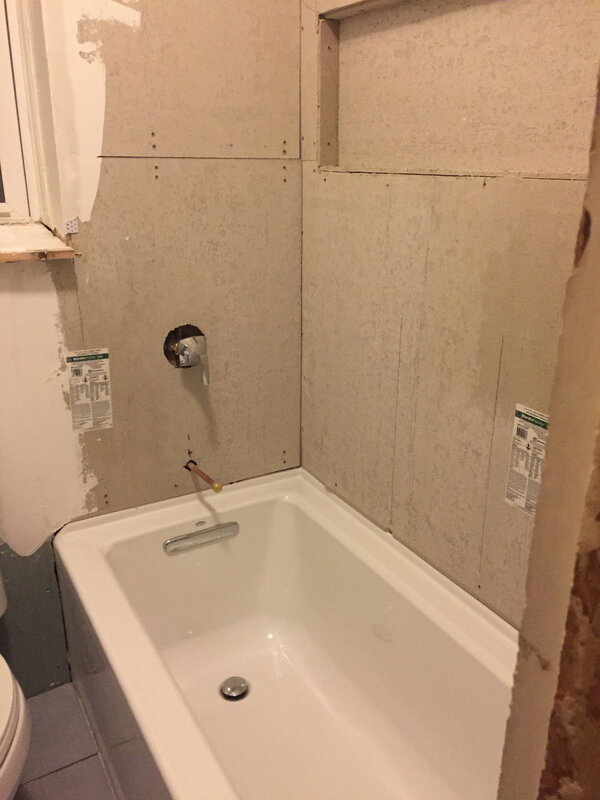 The project began by redesigning the small, aged master bathroom, giving it a classic yet contemporary feel. Due to its small size storage was of great importance to the clients. 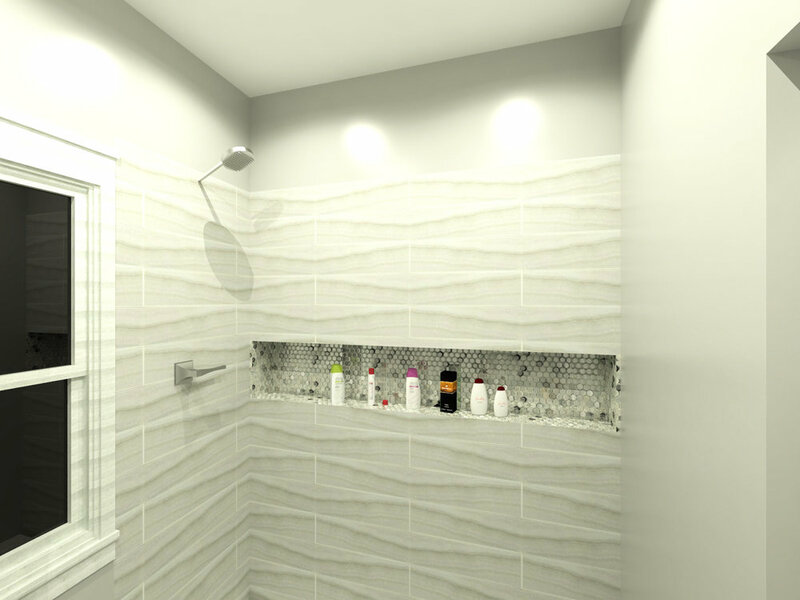 Creating an area for toiletries had to be part of the design plan, so a shower niche was added with soho circle accent tile, a functional and asthetically beautiful touch. 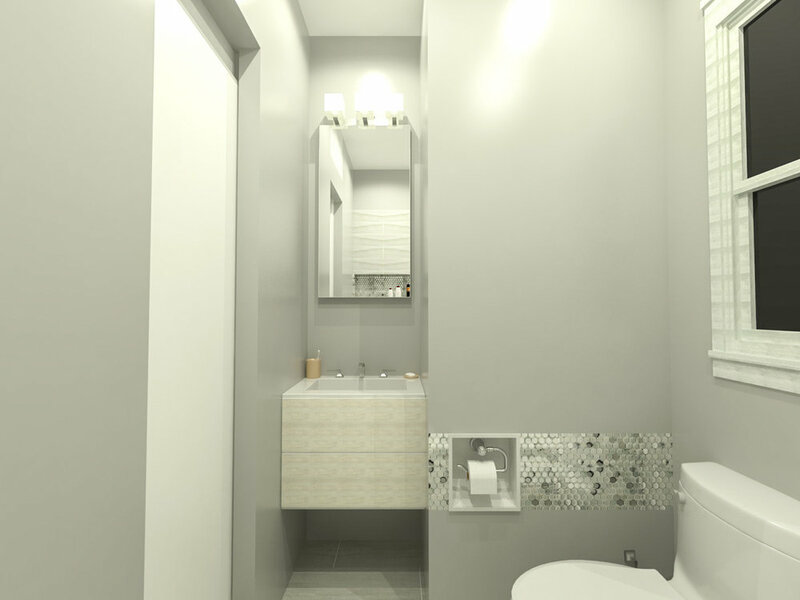 Creating an airy feel to the bathroom was another priority. Selecting 5 x 33 plankstone tile with a touch of gray and white marble like design created a more classic modern and open feel to the space. 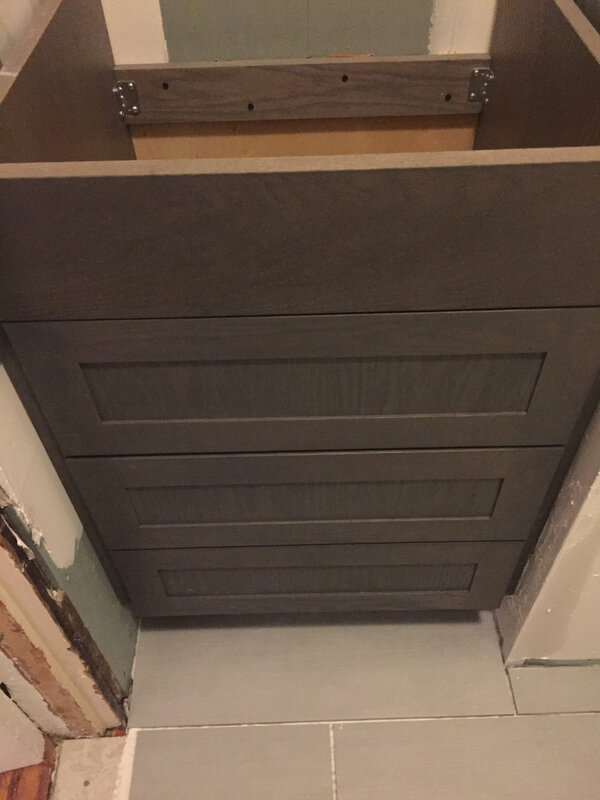 A larger 12 x 24 floor tile, in medium gray, adds warmth. Light fixtures serve both a task and decorative function. 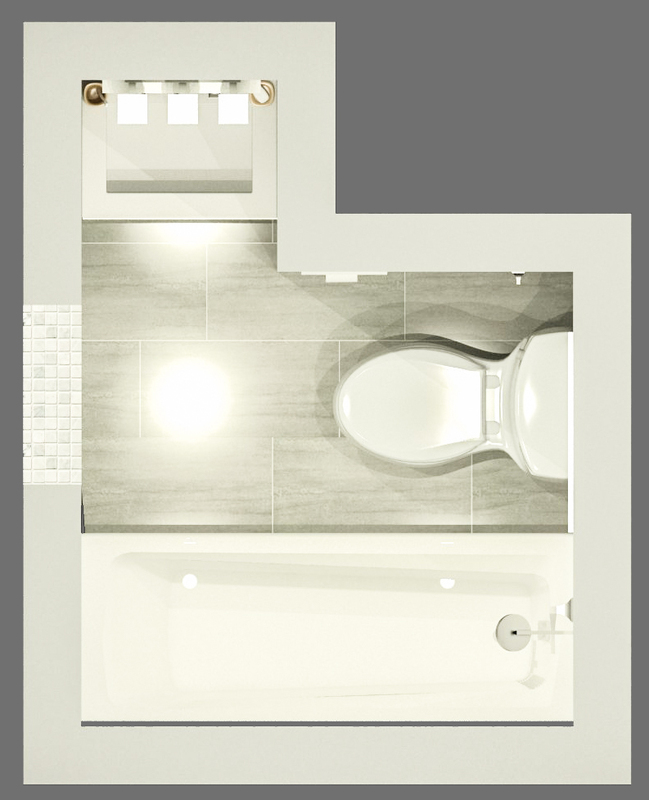 The sleek, modern recessed mirror and medicine cabinet provides additional storage. The clean style of the custom vanity, stained in a steel gray finish, was designed with drawers for more storage. 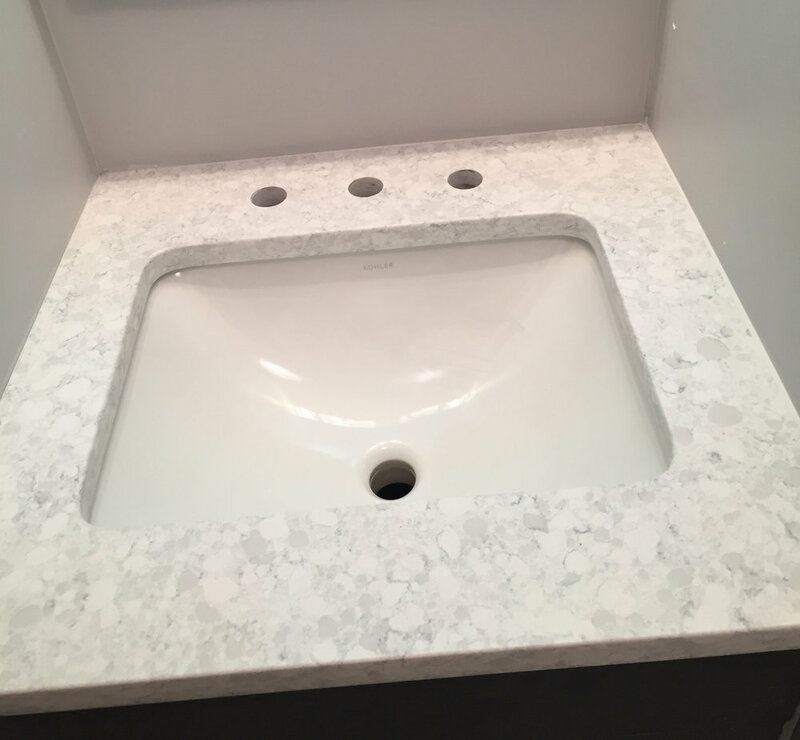 The custom rectangle undermount sink with a gray and white zodiaq top adds to the overall beauty of the space. J. West intricately fused warmth and comfort with a sleek, contemporary design in this Warren, NJ, family room / entertainment center remodel and redesign, delivering to the client exactly what they requested - a cozy gathering place for friends and family to work, watch television, and just kick back and relax.. The contrast of Wood and metal offset the neutral tones of the walls, the perfect backdrop for striking, yet soothing artwork in muted tones. The custom designed entertainment center, with a built-in pivot for the television, was the perfect complement to the elegant style of the fireplace. Custom window treatments were designed to accentuate the elements of the room. the furniture, and furnishings were carefully selected and placed. The accessories, meticulously chosen for a subtle, yet dramatic effect, were the final touches, completing the room. This client desired a warm, contemporary, child-friendly environment for their family to enjoy. J. West composed a complete remodel and redesign of their entire living room space. The project began with the repositioning of the staircase and incorporation of a zen lattice design enclosure giving the clients a light and airy, child-proof entrance to the basement / family room. A pocket door was created to allow access to the downstairs. The bookcase and fireplace surround was custom designed by J. West and built by local craftsmen. The color scheme, furniture and lighting Selection, refurbished floors, custom window treatments, and reframed existing artwork came together to create a fresh, new design. This warm contemporary dining room was completely renovated and redesigned. Moulding was added to the ceiling with a rich accent color. New hardwood floors were also installed. J. West transformed a traditional style home bringing a more contemporary look and feel to each room. Dramatic window treatments frame the two story windows in the family room. 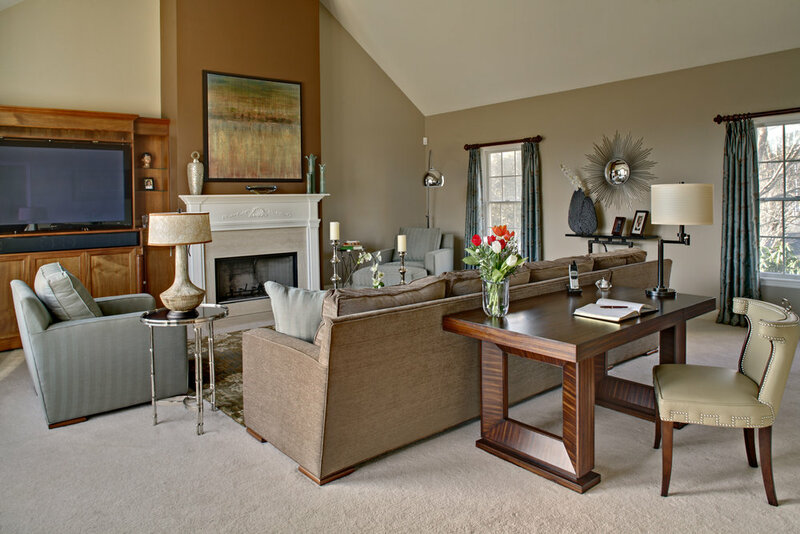 Contemporary furnishings add the finishing touches to this warm, inviting room. Bold paint selections were made for the dining room, providing a striking back drop to the modern chandelier, wall art, table, and chairs. A deep, rich chocolate brown paint color offsets the white and wood bannister on the curved staircase. A beautiful patterned, plush carpet adds movement and elegance. Keeping within the traditional style of the hotel, a beautiful round, wood table was selected as the focal point of the entryway. It serves a dual purpose, both as an accent piece adding to the charm of the spa, and as a functional display / open shelving space for their line of spa products. With no existing event office space, the client requested a room where customers could sit comfortably and review the many options and amenities available to them for their special occasion, wedding, or event. The office needed to accommodate a display of various chair options, fine china selections, as well as a screen to view videos, all done in a traditional style. A design plan was drawn up with glass enclosures, creating an open yet private feel. Traditional leather chairs were selected to complement the beautiful carved inlay desk and credenza. A china cabinet, a true centerpiece, was chosen to display the china collection. Making this office and conference room environment relevant, inviting, and representative of the Chamber was of utmost importance to the client. The space was not refreshing, modern, or inviting to visitors. It lacked style and functionality. 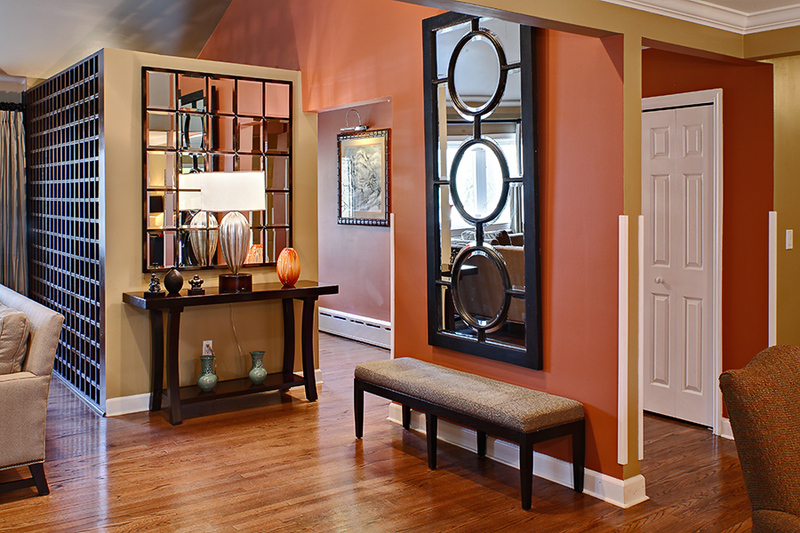 The lackluster entrance and absence of a closet made receiving and welcoming guests difficult. 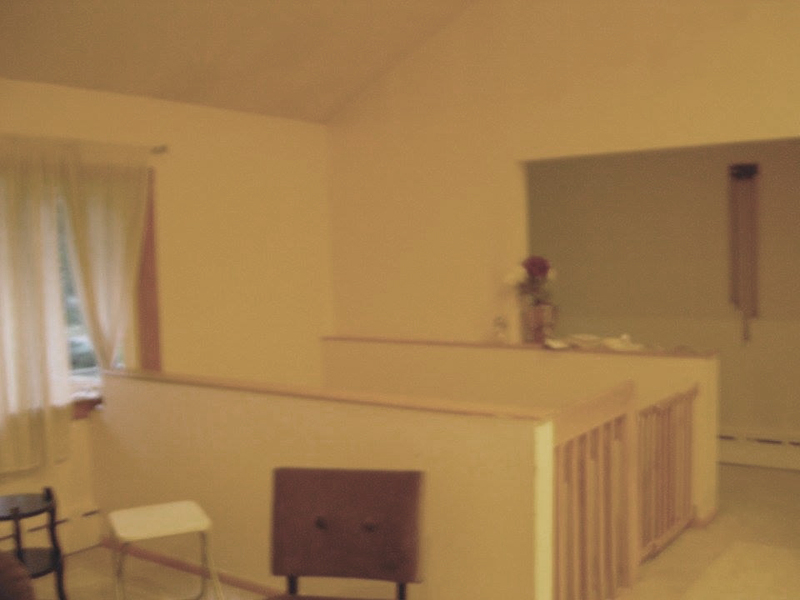 The transformation began with a fresh coat of gray paint and soft yellow accent walls. The entryway was redesigned and finished with a new logo and vibrant art. A closet was built to hang coats and a guest seating area was created. Streamlined workstations in gray fabric, steel finishes, and glass panels updated the space. ergonomic seating finished the look. The conference room was designed to flow with the rest of the office space and served as an additional exhibit for the modern art selections.